Islam, like Christianity has a whole web of various branches of belief shown here. Most Muslims fall into a few groups. About 85% of Muslims are Sunni. 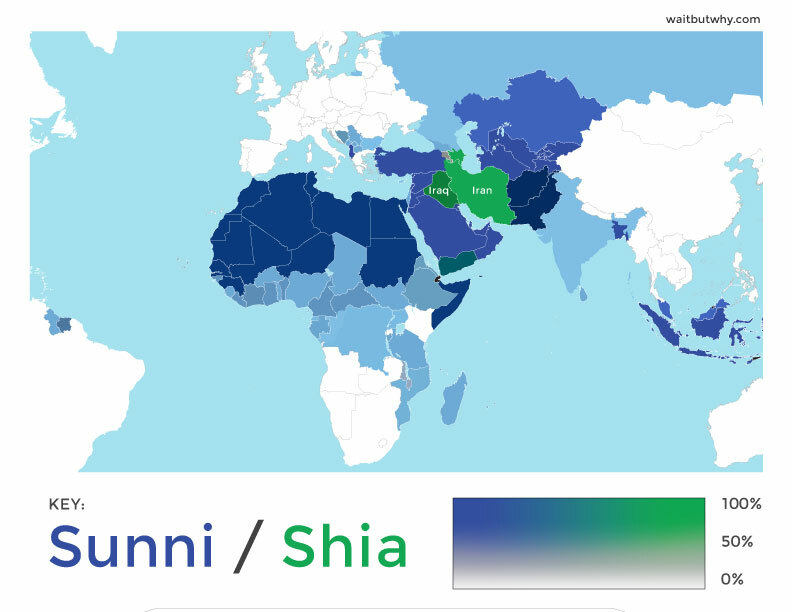 The Shia branch makes up about 10-13% of Muslims. You can see the distribution of Sunni’s and Shia’s around the world in this picture. The Ahmadiyya movement in Islam was founded in India and is regarded by Sunni’s and Shia as heretical. The Sufi branch is a mystical-ascetic form of Islam that deals with the purification of your inner self. This picture shows the population of Muslims by percentage around the world. The largest concentrations are found in the Middle East, North Africa and Indonesia. 1. Belief in Allah. Allah alone is God & idols are not to be worshipped. 2. Belief in Angels. God created sinless angels. Michael, Gabriel – who brought the Qur’an. 4. Belief in the Messengers of Allah. God sent many prophets. Mohammed is the final prophet. 5. Belief in Resurrection after Death. 6. Belief in the Day of Judgement. God reserves the right to send individuals where he pleases. 7. Belief in Divine Decree. Allah’s will is absolute, all embracing, for good or ill.
1. There is the declaration of faith: "There is no god but God (and) Muhammad is his messenger". 2. There is Muslim prayer – pray 5 times a day at set times facing Mecca. If you visit a Muslim country, you will hear the call to prayer broadcast calling the faithful to pray. There is a specific prayer you pray at each time. You start each prayer by standing; you bow, prostrate, and conclude by sitting on the ground. 3. There is the practice of charitable giving based on accumulated wealth. This is obligatory for all Muslims who are able to do so. You can also give voluntarily above this to get a greater reward. 4. There is also the Hajj - a once in the lifetime trip to the holy city of Mecca. 5. Lastly, there is fasting. Muslims fast or refrain from food and drink during the month of Ramadan from dawn until sunset. Ramadan is a time of spiritual reflection, improvement and increased devotion and worship. Ramadan occurs in the 9th month of the lunar Islamic calendar so it moves every year. In 2016 Ramadan starts on June 6 and ends July 5. The question really is: Is Islam Peaceful or Violent? Islam speaks of Jihad which means “holy struggle”. There is a division amongst Muslims about what Jihad means in practice. Some talk of the greater Jihad which is the inner struggle against our natural tendencies to disobey God. The lesser jihad is a struggle against enemies of Islam. The vast majority of Muslims are moderate, pious people who suffer more from terrorism and violence than non-Muslims. Gallup published a poll in 2006 which found that of Muslims surveyed in 10 countries only 7% could be described as political radicals. Political radicals thought that the terrorist attacks of Sept. 11, were “completely justified”, and have an “unfavorable” or “very unfavorable” opinion of the United States. Another comparison to make is that of Islam vs Muslims. Islam is an ideology that traps people and keeps them from seeing the truth found in Jesus. Then there are Muslims. People for whom Jesus died, whom he loves and is seeking to turn from darkness to the light. Some Muslims read the Qur’an and the Hadith and see in there a call to a violent response.